If the color of the year reports are any indication, one of the hottest colors for 2018 is significantly less cheery than the perennially popular millennial pink or vibrant yellow. According to PPG Paint, Glidden, and Olympic Paint & Stains, black should be the hue on everyone’s radar—and if three makes a trend, we’re all on board with this deep and dramatic paint color. That said, despite how beloved this classic color can be (long live the monochrome decor trend), it can be an intimidating shade to try. But with so many different ways to incorporate black decor into your space, it doesn’t have to be: Here, 13 ways to decorate with black that paint commitment-phobes and risk-takers alike will love. Freestanding tubs can make a big difference in a bathroom, and even more so when they’re painted a daring hue. The black bathtub in this West Village townhouse is instantly the focal point of the room, adding contrast to the otherwise whitewashed space and bringing in an elegant feel. If your home comes with exposed ceiling beams but you’re not a fan of the farmhouse look, a fresh coat of paint is all it takes to turn the rustic look modern. Especially when contrasted with stark white walls—and tied into the black slate fireplace—these black beams are a unique finishing touch that really elevate the living room decor. Wit & Delight blogger kate arends wanted to preserve the original 1920s architecture of her home while also incorporating updated amenities, a balance especially evident in this gorgeous black and white kitchen The more retro tiles are offset by sleek black bar chairs that tie in with the black cabinet paint, making for a space that perfectly blends the old with the new. Okay—admittedly, having a seven-door built-in refrigerator is a little aspirational. But there are a few ways you can replicate the look of this stunning Chelsea loft kitchen and make a statement in your own space: For a more hassle-free lookalike, opt for a matte black fridge set against white tiling. Or, if adding a larger built-in refrigerator is in the budget, go for wooden cabinets that you can easily paint black yourself. Check out our tutorial on how to paint your fridge for a more in-depth guide. This built-in bookcase, beautifully captured by Michele Andersen, is one of the more striking ways to style your bookshelf. Here, a deep charcoal provides a bold backdrop for decorative accents and books. The dark hue makes the white shelving pop all the more. In an otherwise stark white bedroom, the matte black pendant lighting adds an edge. Given that the only other hanging is a textured canvas, it doesn’t detract from the minimalist feel but makes the space more interesting than a simple white lamp might have done. This may be the black and white bedroom decor that monochromatic dreams are made of. Create an ombre effect by layering various linen bedding pieces in tones of gray. The result is textured and cozy, creating a calming space that will make you love your bed even more than you already do. A few small updates will ensure that no part of your home goes undecorated. Adding a minimalist hanging light, a small art piece, and a simple armchair is all that’s needed to create a stylish little nook. Opting for a black chair instantly makes the corner more eye-catching. If you’re not totally sold on the subway tile trend (though you definitely should be), compromise by painting the upper half of your walls a deep black shade to balance out the stark white tiling. Swap out the standard metal faucets for matte black ones that’ll make the room feel a little more custom. Alternatively, if you’re willing to go a little more dramatic with your bathroom decor, try something like this space by Wood Melbourne. The deep black wall paint matches both the mirror and the shelf fixture, while an abundance of greenery livens up the room and makes it feel less moody. We love a good accent wall, and this kitchen by Neptune is a prime example of how to properly create one. A glossy black finish ties into the cabinetry and is also reflected in the bar stools and sconces, so that it complements other features of the kitchen. The contrast brings a modern edge that plays off the more rustic features, such as the wooden countertops, quite nicely. Small space decorators, this one’s for you. If you don’t have space for a formal dining room, create a dining nook in the kitchen that feels entirely separate from its surroundings by painting the wall a deep color and coordinating the furniture and decor to it. This particular space is like a room within a room, thanks to a statement light fixture over the table and black paint that contrasts with the rest of the white kitchen. If you want proof as to exactly how a fresh coat of paint can completely transform a space, you need to check out the “before” photos of this now-modern kitchen. 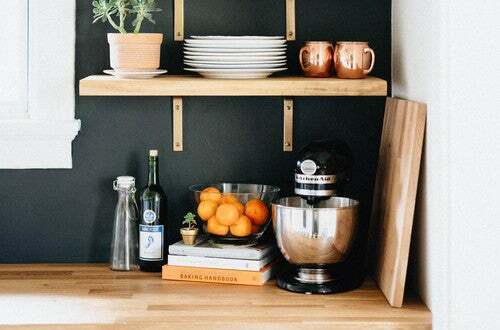 By swapping out the dated cabinets for chicer open shelving and painting the walls a striking black shade, bloggers We Are The Brauns created a clean, minimalist kitchen that somehow still feels bright and airy despite the dark walls.